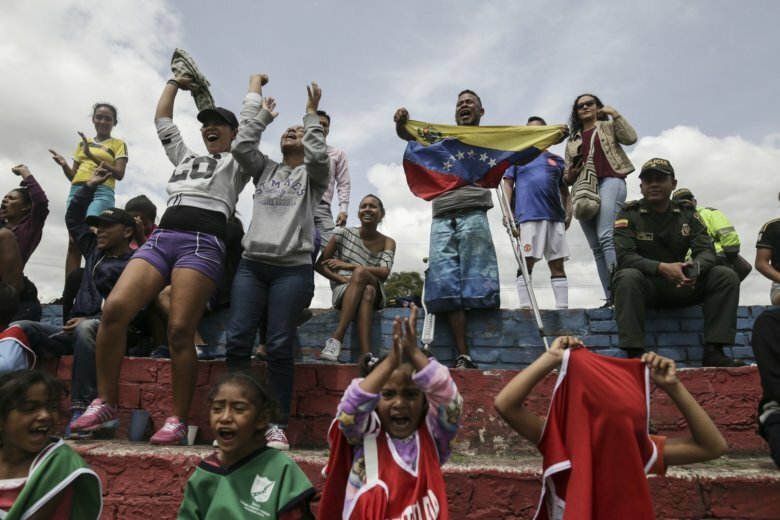 BOGOTA, Colombia (AP) — Colombian officials are hoping to quash tensions at a Venezuelan migrant camp with a game both the new arrivals and their hosts share a passion for: soccer. Migrants faced off against Colombian aid workers in a tournament Wednesday, two days after over a dozen Venezuelans were expelled from the camp after a violent protest over food rations. That incident, in which some migrants looted supplies and clashed with riot police, marked a rocky start for Colombia’s first official camp for Venezuelan migrants, who have flooded the neighboring Andean nation fleeing their own country’s economic and humanitarian calamity. “It’s very good after what happened a few days ago that we could interact with the people here in Colombia,” said Carlos Uriel, a Venezuelan migrant playing in the tournament. Migrants cheered from a small concrete stand as eight-person teams named after famous clubs like Barcelona and Real Madrid clashed on a sunbaked field across from the camp. During a break between games, three young men burst into an acrobatic break dance, making the crowd roar in delight. “This really relaxes you,” said Agustin Perez, 52, a migrant playing for a team called Los Vinotinto, the nickname used by Venezuela’s national squad. Colombian authorities had been hesitant to set up a refugee-style camp for Venezuelan migrants, fearful that it would become a permanent home for many and hinder their integration into society. But after several hundred homeless migrants set up an informal encampment in a park outside a bus terminal in Bogota, officials decided that offering tents and services was a better alternative. Some neighbors disagreed. As the Venezuelans were arriving at the encampment, people shouted at them from nearby apartment buildings and accused them of bringing in crime and disease. Liliana Pulido, director of district planning for Bogota’s mayoral office, said authorities are now looking for ways to facilitate meaningful encounters between the Venezuelan migrants and Colombian citizens. Perez said that many migrants at the camp are still unhappy with the food provided by the city, which has been mostly limited to sandwiches and a piece of fruit. But he said that conditions had been improving since Monday’s protest. “We finally had a hot meal yesterday, with chicken,” he said. City officials have warned that the camp will only function for three months, and they are hoping that in that time, its residents will be able to find work and pay for their own accommodation elsewhere. But many at the camp worry they won’t be able to find jobs until they can legalize their status. Colombia is currently home to more than 1 million Venezuelan migrants and refugees who have fled hyperinflation and food shortages at home. Officials suspect that number could potentially multiply in the years ahead.